Albert Friedrich opened the Buckhorn Saloon on Dolorosa Street in downtown San Antonio in 1881. Friedrich, an avid hunter and outdoorsman, decorated his Saloon with his own trophies. He complemented his collection with the pelts, horns and mounts that trappers, hunters, cowboys and cattlemen would trade for a beer or a shot of whiskey. Some of the largest cattle deals in the Southwest were made at the Buckhorn. By 1890, ten million Texas longhorn cattle had been driven up the cattle trails to Kansas. â€¢ â€œMeet Me in St. Louisâ€, the 1904 Louisiana Purchase Centennial, had more than 12 million visitors. The Buckhornâ€™s 78-point world record whitetail deer antlers were on display and were insured for $5,000.00. â€¢ Pancho Villa discussed plans for the Mexican Revolution of 1910 at the Buckhorn. â€¢ In 1922, when Prohibition was putting most Saloons out of business, the Buckhorn moved to the corner of Houston and South Flores Streets and continued to thrive. Friedrich made up for the loss in revenue from liquor sales by selling lunches and by creating a curio store that sold tens of thousands of unique souvenirs. For many years the armadillo baskets and rattlesnake ties and watch fobs were the most popular items. â€¢ In 1956 the Lone Star Brewery purchased the Buckhorn collection. Harry Jersig, President of the brewery and a friend of the Friedrichâ€™s, continued to add to the collection and had a special building erected on the Lone Star grounds to house the collection. â€¢ In 1968, when the Worldâ€™s Fair was held in San Antonio, the Lone Star Brewery built the Lone Star Pavilion and the â€œHall of Texas Historyâ€ wax museum. â€¢ In honor of the collection, the Lone Star Brewery began brewing Buckhorn beer in 1972.
â€¢ The Lone Star Brewing Company was sold to Olympia Brewing Company in 1977. 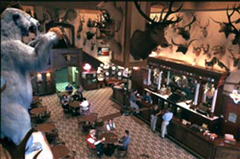 The Buckhorn Collection changed hands five times between 1977 and 1997, when the Strohâ€™s Brewing Company decided to divest itself of the collection. 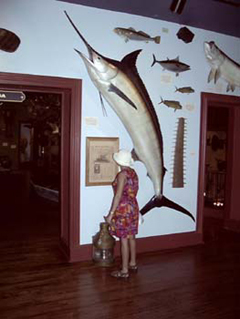 Hall of Fins - See the ones that "DIDN'T" get away! 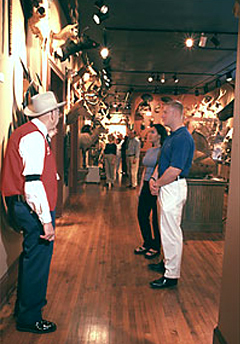 â€¢ In 1997, Friedrichâ€™s granddaughter, Mary Friedrich Rogers, and her husband, Wallace, purchased the world famous Buckhorn collection. â€¢ Twisthorn Holdings and the Buckhorn Museum and Saloon Limited partnership entered into a long-term lease agreement with the Rogers to manage and expand the Buckhorn operations. Today at it’s home on historic East Houston Street, the Museum and Saloon’s rooms, walls and ceilings are filled with the prized pieces of the collection. 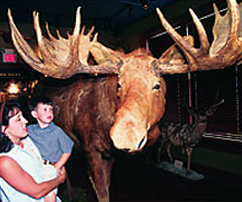 It is as claimed, “Five museums in one – horns, fins, feathers, wax museums and special exhibits.” You can see 520 animal species and a multitude of history featured in the Museum. The Buckhorn is fun family friendly entertainment and educational. Everything from all five of Africa’s “Big Five” to natural oddities like two headed animals and an entire area devoted to bucks with locked horns, which can lead to their death if they cannot separate, along with a group of animals whose antlers have grown in strange formations. Yep, there's a Western thing or two at the Buckhorn! 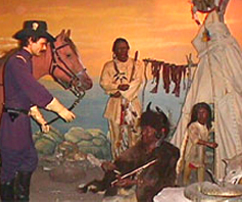 Here you can also take in the Hall of Texas History Wax Museum, which is an interactive look at the last 400 years of Texas history with a section devoted to Texas Ranger history. 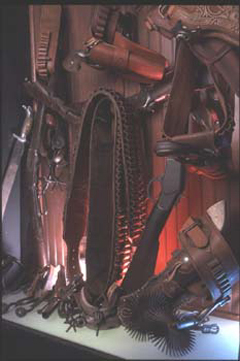 You will see old time western weaponry on display and special exhibits ranging from dinosaurs to “Gunfighters, Outlaws and Lawmen of the Old West…The Truth About the American Gunfighter Era”. This is the kind of place where even after seeing it many times you will notice some nuance or something different that you never noticed before. As far as the food fare and the Saloon goes, first thereâ€™s a full bar to behold. The bar features 7 locally brewed beers on draft including, Shiner Bock, Lone Star Beer, Alamo Beer, and 4 seasonal Real Ale craft beers. For the ladies, we can offer you our famous Prickly Pear Margarita. Even better you can see the menu on their website and remember that they also have the best lunch specials in the downtown area. ATTENTION GROUPS, TOURS, ETC. If you are interested in receiving pricing and related information on group lunches, please contact them at their website and don’t forget to see the The Toepperwein Room at Buckhorn Saloon and Museum that was voted Best Venue in San Antonio by the San Antonio Hotel and Motel Association. Delight your guests with their truly one-of-a-kind atmosphere and award winning catering from Don Strange of Texas.